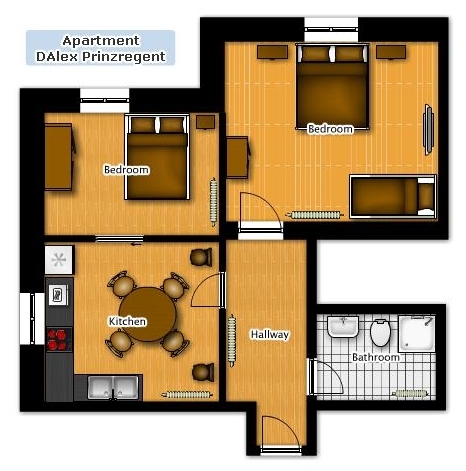 This apartment is the best choice for a family or a group of friends spending some days in Munich. With two separate bedrooms it has a normal capacity of four guests, which can be extended up to 6 guests with the sofa and an extra bed. It has been refurnished with classic elegant elements mixed with modern equipments to guarantee a high living standard. This very quiet 55 squared meters apartment has a kitchenette where you can confortable cook and sit. It is equipped with cooker, oven, fridge, freezer, coffe machine, kettle & microwave. A nice set of cutlery, tableware and glassware is also available for your use. In the bigger bedroom you will find a double bed (160 cm x 200 cm) together with a sleeping/sitting sofa. There is a nice original modernist double bed (140 cm x 200 cm) and wardrobe in the second bedroom. For your entertainment we have provided a wall 32" TV with local an international programs together with a DVD player. The apartment has a bathroom with toilet, shower cabine, towels and hair dryer. Parking is free on the streets in the area.